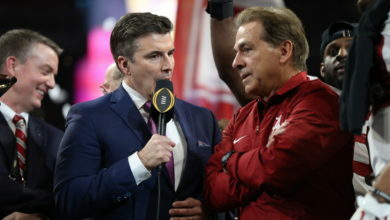 Alabama vs. Clemson: Most-Watched Cable Telecast Since Inaugural CFP National Championship - ESPN Press Room U.S.
ESPN telecast of the College Football Playoff National Championship Presented by AT&T at 8:30 p.m. ET on January 11, 2016 – an Alabama 45-40 victory over Clemson – averaged 25,667,000 viewers, based on a 14.7 rating, the most-watched cable program since the inaugural CFP National Championship (Jan 12, 2015). Additionally, the audience is the sixth best in the history of cable. As a result, ESPN has now aired the eight most-watched programs in the history of cable television (six national title games and CFP semifinals) and 17 of the top 20 programs. ESPN’s Megacast presentation of the CFP National Championship averaged 26,182,000 viewers, with ESPN2 (Film Room) and ESPNU (Homer Telecast) each averaging more than 225,000 viewers throughout the game. ESPN Deportes added more than 55,000 viewers. On ESPN3 — which offered seven exclusive digital feeds — the Spidercam production was the most popular among fans, based on all major metrics. As noted earlier, last night’s national championship set streaming records on WatchESPN, across all sports, excluding the 2014 FIFA World Cup. When factoring in the WatchESPN’s World Cup usage, Alabama-Clemson ranks third all-time in total minutes watched, fifth in unique viewers and sixth in average minute impressions. Last night’s WatchESPN usage is a continued trend of the college football season. Factoring in both the regular season and bowl season, seven of the top 10 most-streamed college football games ever occurred this season and all 10 have occurred over the last 12-months, based on unique viewers. ESPN Megacast: TV Viewership only available for ESPN, ESPN2, ESPNU and ESPN Deportes as SEC Network, ESPNEWS, ESPN Classic and ESPN Goal Line are not Nielsen rated networks. The 2016 College Football Playoff Championship Presented by AT&T will reair on ESPNU and SEC Network this week in a variety of formats. The traditional telecast airs on SEC Network Wednesday (noon) and Friday (9 a.m., 10 p.m.), and also on ESPNU on Friday (1 p.m.). ESPNU’s Homer Telecast Megacast offering – featuring Joe Tessitore and Kaylee Hartung calling the game from the sidelines with Alabama “Homer” Barrett Jones and Clemson “Homer” Tajh Boyd – reairs on ESPNU, Thursday (1 p.m.) and on SEC Network for the first time, Friday (noon). ESPN2’s Megacast offering of the coaches CFP Coaches Film Room airs on ESPNU on Wednesday (1 p.m.) with five head coaches commenting on the game live -Larry Fedora (North Carolina), Jim McElwain (Florida), Will Muschamp (South Carolina), Pat Narduzzi (Pittsburgh),and Willie Taggart (South Florida). SEC Network closes out the options with guest analyst Bret Bielema (Arkansas Head Coach) joining analysts Greg McElroy and Booger McFarland, along with Paul Finebaum and his host of callers in Finebaum Film Room, reairing Thursday (noon).